This post was written for Pharmaphorum, you can see original article here. Even though market growth is attractive in Latin America, there are big challenges for the pharmaceutical industry to overcome. One of the challenges is that each country is a world on its own and multinationals need to adjust to the different regulations regarding sales, clinical research, market access and GMP amongst other. There has been some improvement in this area in the last couple of years with agreements between the health authorities in the countries that allow for certifications in one to be valid in another country. An example is the agreement between Argentina, Brazil, Colombia and Cuba that allow GMP certification in one of them to be valid in the others4. Multinational pharma companies need to have good relations with the government and work together with them in the development of the healthcare policy so as not to be left out. They need to make sure governments understand they are key players in healthcare and they can help the healthcare system. Pharmaceutical companies also experience trouble with local industry protection on behalf of the government. Multinationals need to have their eyes opened and try to work out partnerships with local companies so they are not left out. They need to watch their prices because some of them become extremely high because of the amount of intermediates in the supply chain. In Colombia, for example, drug prices are regulated and since December 2013 these regulations are finally affecting pharmacies. This helps protect the consumer and also the pharmaceutical companies because intermediates can’´t manage their prices as they please, resulting in highly elevated prices for original medications. Report: Latin America Emerging Pharmaceutical Markets – Argentina, Chile, Colombia, Perú and Venezuela. 2012. Beyond Emerging- Latin America´s Pharma Industry is coming on its own. Sep 2013. Booz&Co. Report. Pharma Emerging Markets 2.0. 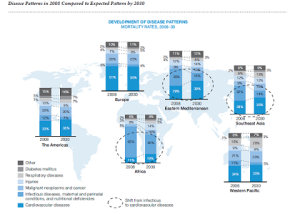 How emerging markets are driving the transformation of the pharmaceutical industry. 2013.